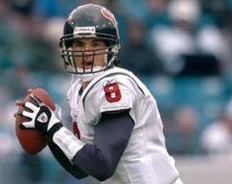 On September 29, 2002 the Houston Texans made their first visit to Philadelphia to take on the Eagles in a Week 4 contest. 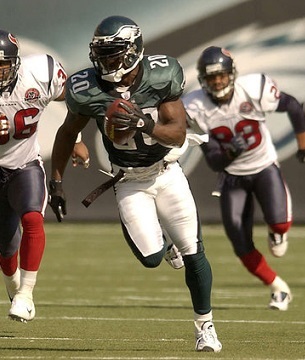 While the result yielded no surprises, Philadelphia’s star free safety Brian Dawkins distinguished himself in multiple ways, one of which was unique in his outstanding career. The Eagles, coached by Andy Reid, had a pass-oriented offense directed by QB Donovan McNabb with a running game that had been only fair thus far in the young season. The defense was good at pressuring opposing passers as well as in coverage. In addition to Dawkins, key players included DE Hugh Douglas, LB Shawn Barber, and cornerbacks Troy Vincent and Bobby Taylor. Philadelphia reached the NFC Championship game in 2001 and was 2-1 thus far in ’02, having won decisively in the previous two games after losing to Tennessee in the season opener. Houston was a first-year team under Head Coach Dom Capers and carried the usual expansion club problems into the season. 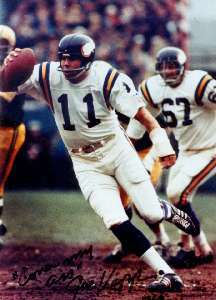 QB David Carr, a rookie who was the first overall selection in the NFL draft, was placed directly into the starting lineup behind a makeshift line. The Texans upset the Dallas Cowboys in their first regular season contest but had scored a total of six points in losing their next two games to come into Philadelphia at 1-2. There were 64,867 fans in attendance at Veterans Stadium. The teams traded punts to start the game before the Texans drove 69 yards in six plays that was helped along by a pass interference call on Troy Vincent in a third-and-six situation. David Carr completed passes to WR Corey Bradford for 26 yards to ignite the series and 23 yards to conclude it with a touchdown. Kris Brown added the extra point. Houston got the ball back on the next play from scrimmage when SS Eric Brown intercepted a Donovan McNabb pass, thus giving the visitors excellent field position at the Philadelphia 34. However, DE Brandon Whiting sacked Carr for an eight-yard loss and two incompletions forced the Texans to punt. The Eagles moved methodically down the field in response as McNabb completed six passes and WR James Thrash ran for 19 yards on a reverse. The drive finally stalled at the Houston seven and David Akers kicked a 25-yard field goal to make it a 7-3 contest. On the next series, Carr fumbled after running for nine yards on a third down play. Brian Dawkins recovered and, in a series that extended into the second quarter, the Eagles advanced 58 yards in nine plays. McNabb threw to FB Cecil Martin for 16 yards to the Houston 26 and a sack was nullified by a face mask penalty. RB Duce Staley ran for a one-yard TD and, with Akers kicking the point after, the home team was in front by 10-7. The Texans were forced to punt following their next series that included two sacks of Carr and the Eagles, taking over from their own 36, advanced to another score. 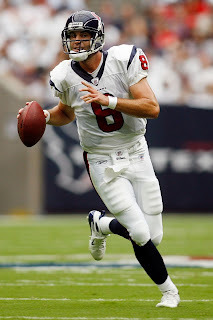 McNabb connected with Staley and Martin for completions of 13 and eight yards, respectively, and a sack was followed by a defensive holding penalty on Houston. A short run was followed by a McNabb pass to WR Todd Pinkston that picked up five yards and another throw to Pinkston gained 34 yards to the Houston six. Two plays later, Staley scored his second touchdown from a yard out. Akers converted and Philadelphia extended its lead to 17-7. The Eagles got the ball back on the next series when Dawkins intercepted a Carr throw and returned it 27 yards to the Houston 30. It resulted in a short possession that ended with Akers kicking a 41-yard field goal and the score remained 20-7 at halftime. The Eagles had the first possession in the third quarter and reached their 43 before lining up to punt. However, RB Brian Mitchell tossed a shovel pass to Dawkins instead, and the safety-now-receiver raced 57 yards for a touchdown (pictured at top). McNabb threw to TE Chad Lewis for a two-point conversion and big 28-7 lead. Houston put together a series that ended with Carr throwing to Bradford for a 29-yard TD and Brown added the PAT to cut Philadelphia’s lead in half, but other than a 48-yard field goal by Brown later in the period, the Texans were finished with scoring for the day. McNabb threw to Thrash for a 38-yard TD in the fourth quarter to cap the 35-17 win for the Eagles. Philadelphia easily held the lead in total yards (391 to 242) and first downs (21 to 12) while running sixteen more plays than the Texans (76 to 60). The Eagles also accumulated seven sacks to three by the Texans. Each team turned the ball over three times while Houston was penalized 11 times, to four flags thrown on Philadelphia. Brian Dawkins had a noteworthy day as he recovered a fumble, intercepted a pass, recorded a sack, and caught a pass for a 57-yard touchdown. Donovan McNabb completed 24 of 42 throws for 259 yards and a TD while giving up one interception, and also ran the ball seven times for 23 yards. Duce Staley rushed for 33 yards on 12 carries that included two short touchdowns and had three pass receptions for another 39 yards. Todd Pinkston led Philadelphia’s receivers with 6 catches for 70 yards. For the Texans, David Carr (pictured at right) completed 16 of 29 passes for 188 yards and two touchdowns and two interceptions. Corey Bradford had 7 receptions for 97 yards and both TDs. RB James Allen was the leading rusher with 41 yards on 14 attempts. The Eagles lost their next game but only twice more the rest of the way in compiling a 12-4 record to once again top the NFC East, and despite the loss of Donovan McNabb to a broken ankle in the tenth game, although he returned for the postseason. Philadelphia again advanced to the conference title game and again came up short, losing to Tampa Bay. Houston lost its next two contests and ended up at 4-12 to place fourth in the AFC South. David Carr was sacked a record 76 times through the course of the year but the rookie took every snap. Brian Dawkins went on to achieve consensus first-team All-NFL honors for the second straight year as well as a third Pro Bowl selection. 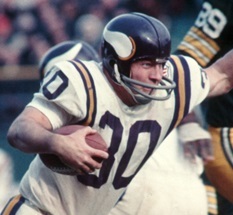 He intercepted two passes, recovered four fumbles, and was credited with three sacks. The touchdown catch against the Texans remained the only pass reception of his 16-season career. The Monday night game on September 26, 1977 featured the Cleveland Browns hosting the New England Patriots. 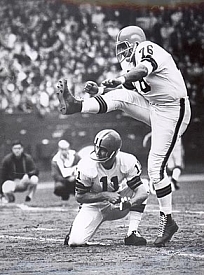 The Browns were coming off of a 9-5 record in ’76 under Head Coach Forrest Gregg. 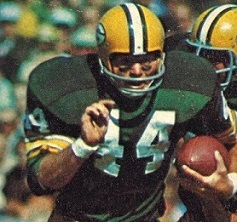 QB Brian Sipe had emerged from an obscure backup role to replace the disappointing Mike Phipps and there was a fine all-purpose runner in HB Greg Pruitt (pictured at right). Cleveland pulled off an upset the previous week in defeating the Bengals and were 1-0 as they faced another significant test. The Patriots were coached by Chuck Fairbanks and reached the playoffs the previous year with an 11-3 tally. QB Steve Grogan, like Sipe, had been unheralded coming into the league and was effective both passing and running with the ball. While the holdouts of G John Hannah and OT Leon Gray caused disruption, there was a good corps of running backs, starting with FB Sam “Bam” Cunningham and TE Russ Francis was one of the best at his position. 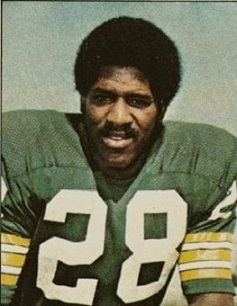 The defense was tough, with CB Mike Haynes and FS Tim Fox coming off of outstanding rookie seasons. New England had also won its opener against Kansas City. There were 76,413 fans in attendance at Municipal Stadium. The Browns had the first possession and advanced 85 yards in 12 plays. Brian Sipe completed a third-and-five throw to Greg Pruitt that picked up 35 yards to the New England 11 and Pruitt tossed an option pass to FB Brian Duncan for a five-yard touchdown. 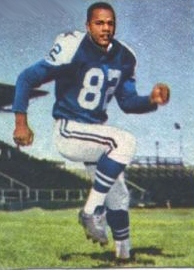 Don Cockroft added the extra point for a 7-0 lead. The Patriots punted following a short series but got the ball back when SS Prentice McCray intercepted a Sipe pass at the New England 29. They again had to punt and, helped by a 23-yard return by DB Roland Woolsey, the Browns again advanced into New England territory in the final minutes of the opening period. 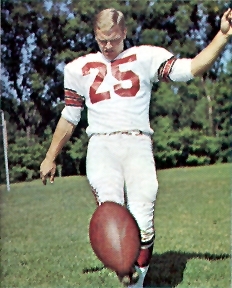 The drive stalled at the 26 early in the second quarter and Cockroft missed to the right on a 44-yard field goal attempt. The Patriots made the most of the reprieve, moving methodically down the field. Steve Grogan completed a pass to HB Don Calhoun that gained 21 yards and had additional yards tacked on due to a facemask penalty on the Browns. 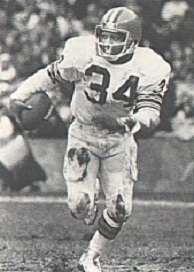 Following two carries by HB Ike Forte, Grogan finished the 10-play, 74-yard series with a throw to Sam Cunningham (pictured below) in the end zone for an eight-yard TD. John Smith tied the score with his successful conversion. 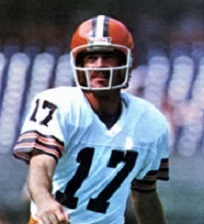 On the first play following the ensuing kickoff, Tim Fox intercepted a Sipe pass and returned it to the Cleveland 22. The Patriots couldn’t reach the end zone but they did put more points on the board with Smith’s 35-yard field goal to go ahead by a 10-7 tally. That was it for the scoring until a 46-yard punt return by Mike Haynes gave the Patriots the ball at the Cleveland 29 with 1:33 remaining in the first half. Cunningham and Grogan ran the ball down to the two, from where Calhoun scored a touchdown. Smith’s extra point made the halftime score 17-7 in favor of the visitors. The Patriots had the ball first in the third quarter and punted. Cleveland advanced 54 yards in six plays as Pruitt ran for 11 yards on two carries and caught a pass for another six, and Sipe threw to TE Gary Parris for a 26-yard TD. Cockroft’s PAT made it a three-point game at 17-14. The Browns immediately regained possession when CB Raymond Clayborn fumbled on the kickoff return and WR Ricky Feacher recovered for Cleveland at the New England 25. 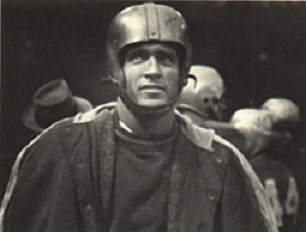 While the offense went three-and-out, Cockroft tied the score at 17-17 with a 37-yard field goal. The Patriots got just past midfield on the next series but again had to punt. Starting from their 12, the Browns got a boost when Pruitt took off for a 37-yard run with a facemask penalty added on and they were into New England territory heading into the fourth quarter. 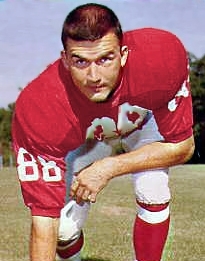 However, they came up empty when Cockroft tried for a 39-yard field goal that was blocked by LB Rod Shoate. New England responded with a 61-yard drive that took 13 plays. Grogan completed a pass to WR Steve Burks for 22 yards in a third-and-12 situation and Calhoun and Cunningham ran effectively. Grogan converted another third down play with a throw to Forte for 10 yards to the Cleveland two, and while the Patriots lost yards on the next two plays, Grogan connected with Russ Francis in the middle of the end zone for a six-yard touchdown. Smith converted and the visitors were back on top by 24-17 with 7:28 to play in regulation. The Browns came back with a seven-play, 73-yard possession. Pruitt had a 17-yard run and Sipe completed passes to Parris for ten yards, WR Reggie Rucker for nine, and WR Dave Logan for 19 yards to the New England 13. It was Sipe to Pruitt for an eight-yard TD and, with Cockroft’s kick, the score was again knotted at 24-24. Cleveland scored again after a Grogan pass was picked off by LB Charlie Hall. That gave the Browns the ball at the New England 27 and led to a 37-yard Cockroft field goal and a lead of 27-24 with the clock now down to 55 seconds. That was still enough time for the Patriots to mount a drive. Grogan completed four passes to move New England down the field, the biggest to Francis for 28 yards to the Cleveland 17 with one second remaining. Smith kicked a 24-yard field goal to send the contest into overtime. The Browns won the toss for the extra period, received the kickoff, and never gave up the ball. Sipe scrambled for four yards in a third-and-one situation and completed a pass to Parris for 12 yards while facing third-and-eight. A throw to Logan that picked up 22 yards got the ball into scoring territory at the New England 19, and two plays later Cockroft kicked a 35-yard field goal at 4:45 into overtime. Cleveland won by a final score of 30-27. The Browns led in total yards (393 to 263) and first downs (25 to 21). They also turned the ball over three times, to two by New England, but the Patriots drew 12 penalties at a cost of 80 yards to five flags thrown on Cleveland. Greg Pruitt had an outstanding night for the Browns as he rushed for 151 yards on 26 carries, caught four passes for another 51 yards and a touchdown, and threw a scoring pass. Brian Sipe (pictured at right) completed 18 of 25 throws for 199 yards and two TDs while giving up two interceptions. FB Cleo Miller, who gained 31 yards on 11 rushing attempts, also had four pass receptions, for 19 yards. For the Patriots, Steve Grogan completed 15 of 23 passes for 172 yards and two touchdowns while being picked off once. Sam Cunningham gained 70 yards on 18 carries and also topped the club with 7 pass receptions for 52 yards and another TD. Don Calhoun contributed 49 yards on 13 rushes that included a TD. The Browns had pulled off two upsets to start the season, and while they lost the next two games, they reeled off three straight victories to be in first place with a 5-2 record at the midway point. They faltered from there and the loss of Brian Sipe for the last five games proved fatal as Cleveland won only one of its last seven contests to end up at 6-8 and at the bottom of the AFC Central Division, costing Coach Gregg his job. New England lost the next week, and while the Patriots then won four straight games, a midseason slump caused them to finish at 9-5 and third in the AFC East, just missing out on a Wild Card playoff slot. 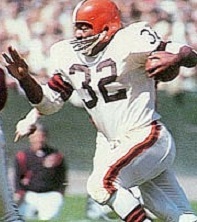 In his fifth year with the Browns, Greg Pruitt was chosen to his fourth Pro Bowl as he rushed for 1086 yards on 236 carries, both career highs, for a 4.6-yard average and caught 37 passes for 471 yards (12.7 avg.). His 1557 yards from scrimmage ranked third in the NFL. In addition to the Pro Bowl selection, he received second-team All-NFL honors from the Newspaper Enterprise Association and second-team All-AFC recognition from UPI. The Buffalo Bills were at 1-1 and struggling as they traveled to Houston to take on the Oilers, also 1-1, on September 24, 1989. Head Coach Marv Levy’s team was coming off of a 12-4 division-winning year in ’88 and much was expected. 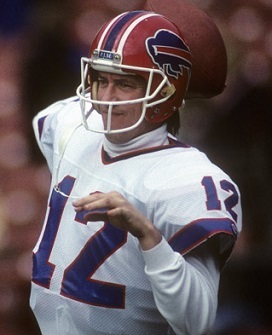 The offensive nucleus of QB Jim Kelly (pictured above), RB Thurman Thomas, and WR Andre Reed was back, but Buffalo had problems with turnovers the previous week in a loss at home to Denver. The defense likewise had outstanding performers in DE Bruce Smith, LB Cornelius Bennett, and FS Mark Kelso. Houston was coached by brash Jerry Glanville and went 10-6 in 1988. QB Warren Moon was a highly productive passer coming off of consecutive Pro Bowl years and he had a good group of receivers available. The defense had talent, too, and was very aggressive, but could also give up big plays. Still, they had been nearly impregnable at the Astrodome, which had come to be nicknamed “The House of Pain”. There were 57,278 fans in attendance at the Astrodome. The Bills took the opening kickoff and advanced 55 yards in six plays. The big one was a pass from Jim Kelly to WR Flip Johnson for 36 yards to the Houston 30. The visitors picked up another five yards before Scott Norwood kicked a 43-yard field goal. Houston responded with an eight-play, 70-yard scoring drive. 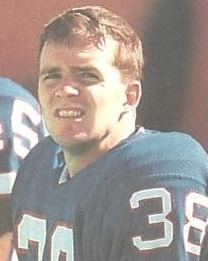 Warren Moon completed two short passes before connecting with WR Drew Hill for a gain of 48 yards to the Buffalo one. Two plays later Moon went up the middle for the remaining yard and a touchdown. Tony Zendejas added the extra point and the Oilers were ahead by 7-3. 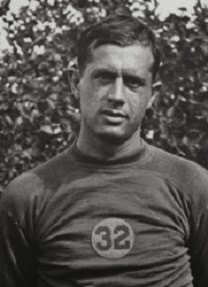 The Bills reached Houston territory on their next series but had to punt, although they got the ball back shortly thereafter when SS Leonard Smith intercepted a Moon pass and returned it 22 yards to the Oilers’ 23. It took four plays to reach the end zone as Thurman Thomas ran twice for 14 yards, Kelly passed to Andre Reed for three more, and then Thomas caught a pass for a six-yard TD. Norwood converted and Buffalo was ahead by 10-7, which remained the score at the end of the opening period. Early in the second quarter, Moon had another pass picked off, this time by Mark Kelso (pictured at left), who ran it back 43 yards to the Houston 31. Thomas ran for 19 yards on the next play, but the drive stalled at the eight and Norwood kicked a field goal from 26 yards to extend the Buffalo lead to 13-7. The Oilers came back with a long drive of 81 yards in 18 plays that ran 10:16 off the clock. 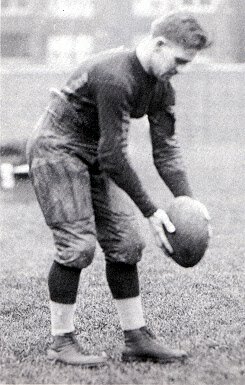 Moon completed seven passes along the way, two of which converted third downs, each team was penalized twice, and Buffalo CB Derrick Burroughs had to be carried off the field on a stretcher (it would prove to be a career-ending neck injury). Zendejas kicked a 26-yard field goal to narrow the margin to 13-10. The Bills got the ball back with 57 seconds left and had to punt from deep in their own territory. Houston had called its three timeouts during that series and regained possession at the Buffalo 39 following a 14-yard punt return by safety Kenny Johnson with the clock now down to 27 seconds. 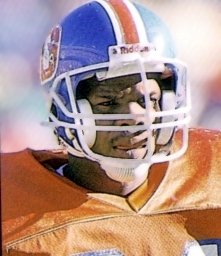 Moon completed one of three passes to move the Oilers ten yards closer, but the field goal attempt by Zendejas was blocked by LB Darryl Talley and Kelso returned it 76 yards for a touchdown. The Bills took a 20-10 lead into halftime. Houston had the first possession in the third quarter and punted. The Bills extended their lead when Kelly fired long for WR Don Beebe on a third-and-eight play and it covered 63 yards for a TD. Norwood again added the extra point and the visitors were now up by a formidable 27-10 tally. The Oilers responded by going 75 yards in 11 plays. Moon completed two passes and had a 12-yard scramble, although he was also sacked for a loss of 12 yards. RB Alonzo Highsmith twice converted third downs with runs of 13 and six yards, and it was Highsmith running for a four-yard touchdown. Zendejas converted and it was a ten-point game of 27-17. The Bills were forced to punt on their next series, and now it was Houston’s turn to make a big special teams play. Kidd’s kick was blocked by rookie SS Bubba McDowell and CB Cris Dishman recovered and ran seven yards for a TD. Zendejas added the extra point and it was suddenly a three-point game at 27-24 with 27 seconds remaining in the period. On the first play of the fourth quarter, Kelly extended Buffalo’s lead by throwing to Reed for a 78-yard touchdown. Norwood made good on the PAT and the score was 34-24. Houston came back with a 76-yard drive in eight plays. Moon completed passes to WR Haywood Jeffires for 14 yards and WR Ernest Givins for 15, and finished off the series with another pass to Givins that was good for a 26-yard TD. Zendejas added the point after and the Oilers were just three points behind at 34-31. 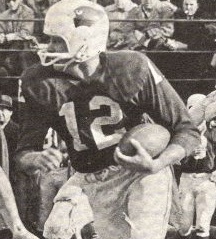 The momentum continued to remain with Houston as a Kelly pass was intercepted by CB Steve Brown on the next possession and returned 41 yards to the Buffalo seven. Four plays later, RB Lorenzo White ran for a one-yard touchdown and, with Zendejas adding the PAT, the home team was now ahead by 38-34. The Bills started their next series with 4:40 left in regulation and Kelly immediately hit on passes of 15 yards apiece to Johnson and TE Pete Metzelaars. Following a penalty on the Oilers, Thomas (pictured at right) caught a pass for five yards and then ran for another nine before Kelly threw to Reed for 14 yards to the Houston 20. 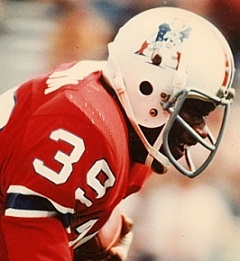 Following an incomplete pass, Kelly was sacked by DE William Fuller for a six-yard loss, but the Bills scored when Kelly connected with Thomas for a 26-yard TD. Norwood’s conversion put the visitors up by three at 41-38. The Oilers got the ball back following the kickoff at their own 13 with 1:52 left on the clock. Moon was sacked on first down but, digging out of the hole with a pass to Jeffires that initially appeared to have been fumbled, converted a fourth-and-three situation with a throw to Duncan for nine yards. Four more passes got the ball to the Buffalo 29, but a false start moved Houston back five yards. Zendejas came through with a 52-yard field goal to tie the score at 41-41 and send the game into overtime. The Oilers had the first possession in OT and a third-and-ten pass from Moon to RB Alonzo Highsmith gained 32 yards to the Buffalo 49. A 17-yard run by Moon and a completion to Highsmith for 11 got the ball to the Buffalo 19, but a loss on a running play and a penalty backed the home team up. Still, it looked good for Houston when Zendejas came in to try for a 43-yard field goal, but his kick was blocked by LB Ray Bentley. The Oilers got a break when the Bills were called for being offside and Zendejas tried again, this time from 37 yards. The kick wasn’t blocked, but it wasn’t good either, missing wide to the left. Now it was Buffalo’s turn. Kelly threw to Reed for 13 yards, Metzelaars for 21, and TE Keith McKeller for six yards to reach the Houston 40. Kelly ran for 13 yards and, two plays later, his pass to Reed, who spun a way from a defender, went 28 yards for the game-winning touchdown. With 6:18 left in overtime, the Bills came out on top by a final score of 47-41. The teams combined for 888 yards, with Buffalo holding a 449 to 439 edge. The Oilers led in first downs (33 to 22) and time of possession (43:11 to 25:31). Houston also turned the ball over twice, to one by the Bills, who were penalized 13 times at a cost of 84 yards to 11 flags for 64 yards thrown on the Oilers. Jim Kelly completed 17 of 29 passes for 363 yards and five touchdowns while giving up one interception. He also ran for 43 yards on three carries. Andre Reed had five catches for 135 yards and two TDs and Flip Johnson also had five receptions, for 86 yards. 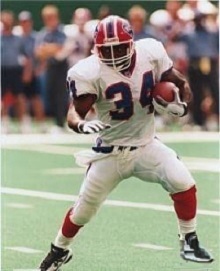 Thurman Thomas topped the Bills with 58 rushing yards on 12 attempts and also contributed three catches for 37 yards and two touchdowns. 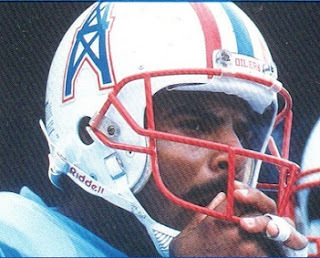 For the Oilers, Warren Moon (pictured below) was successful on 28 of 42 throws for 338 yards and a TD with two interceptions, and ran five times for 36 yards and a score. Alonzo Highsmith ran for 55 yards on 14 attempts that included a touchdown and added 47 yards on four catches. Curtis Duncan and Haywood Jeffires had six pass receptions apiece, for 69 and 57 yards, respectively. The Bills won six of their next nine games before losing three straight and finishing up at 9-7, which was still good enough to again finish first in the AFC East. They lost to the Browns in the Divisional playoff round. Houston also ended up with a 9-7 record to place second in the AFC Central and secure a Wild Card postseason slot. The Oilers lost to Pittsburgh in the Wild Card round. Jim Kelly missed three games with a shoulder injury and ended up passing for 3130 yards and 25 touchdowns. Thurman Thomas rushed for 1244 yards and picked up another 669 yards on 60 catches to lead the NFL in all-purpose yards with 1913. He was selected to the Pro Bowl, as was Andre Reed with his 88 pass receptions for 1312 yards (14.9 avg.) and nine TDs.